You’ve heard the expression, “We are what we eat.” That’s as true of cats as it is of humans. Food can make a difference in your cat’s health, energy level and coat. And the kind of food you feed, not the amount, can make your cat obese. Cats are obligate carnivores and need animal protein and moderate amounts of fat. And their bodies are designed to get most of the moisture they need from their food, not a bowl of water. Wet food creates urine pH that is inhospitable to the formation of bladder stones and crystals. And it keeps the cat well hydrated. 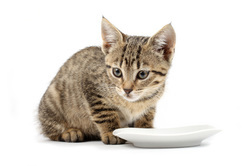 Veterinary endocrinologist Deborah Greco says wet food most closely replicates a cat’s natural diet... mice. While raw or homemade food is best, veterinarian and feline diabetes expert Elizabeth Hodgkins says any kind of \wet food is better than any kind of dry. Avoid flavors that contain rice or pasta. It’s best to avoid flavors that contain wheat gluten, too. It’s a myth that dry food is good for a cat’s teeth. Cats’ teeth are designed to tear meat, not chew little pieces of kibble. And cats don’t actually chew dry food. They either swallow it whole or splinter it. The little splinters can get under the gums and cause gum disease. Another problem with dry food is that most brands contain more grain than meat. But cats’ bodies don’t use the carbohydrates in grains efficiently, and in most cats they turn to fat. Dry food also doesn’t provide enough moisture, even if the cat drinks a lot. 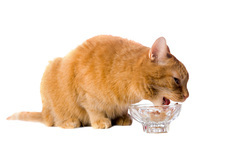 Many veterinarians believe cats on all- or mostly-dry-food diets are always slightly dehydrated. Cats recognize food as food, not so much by the way it tastes but by the way it smells and feels in their mouths. If your cat has eaten only dry food all of his life, making the switch could be difficult and could take some time. Here are some suggestions. — Try putting just a tiny crumb of wet food underneath his dry. Use a separate small bowl because dry food can become moldy and toxic when wet. Increase the amount of wet food gradually, until that’s all the cat is eating. — Put a small bowl of wet food beside the cat’s dry. Some cats like to experiment and will try the wet food if it’s right there. — Sprinkle something really enticing on top of the food. A few suggestions: catnip, treats, Parmesan cheese or the probiotic FortiFlora. Most vets sell FortiFlora. Other suggestions are Stella and Chewy’s freeze dried raw chicken and Halo Liv-A-Littles. You can crumble either one over the food or put whole pieces on top. — Help the cat make the transition from food that doesn’t crunch by offering tuna, meat baby food, cooked chicken or deli chicken or turkey with no preservatives or artificial flavoring. It takes some cats years to transition completely from dry to wet food, but most do eventually. In the wild, cats eat about 15 times a day. Instinct tells your cat he needs constant access to food or needs to eat several times a day. Forcing cats to eat the amount of food determined by humans on a human schedule can be very stressful for cats, especially strictly indoor cats, and can cause them to obsess about food. If you’re not able to feed four or five small meals a day, let your cat free-feed wet food. 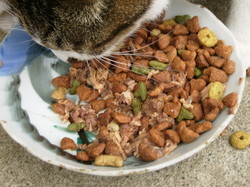 It doesn’t go bad if it’s left out for several hours, and your cat will be able to eat the way instinct tells him to. He needs about 20-30 calories per pound of body weight a day. Never withhold food. If you tell your cat, “Eat this or starve,” he just might choose to starve!